Part of the reason for Tesla winning the contract to build the most powerful energy storage project in the world, a 100 MW/129 MWh Powerpack system in South Australia, was Tesla’s promise that they could deliver it in 100 days or it would be free. It looks like Tesla is on schedule since they just sent out invitations to a ‘celebration’ event at the site. As we reported last week, Tesla even extended its planned Supercharger route in Australia all the way to the giant Powerpack project. The new system is located at Neoen’s Hornsdale Wind Farm near Jamestown, South Australia. Tesla CEO Elon Musk hinted that Tesla would try to get the system online by the end of September and while we already knew that he would be nearby at the end of the month since he is attending the 2017 International Astronautical Conference on September 29, now they confirmed that there will also be an event for the project on the same day. It certainly makes for an impressive image – not unlike Tesla’s visually stunning Powerpack and solar project in Kauai. 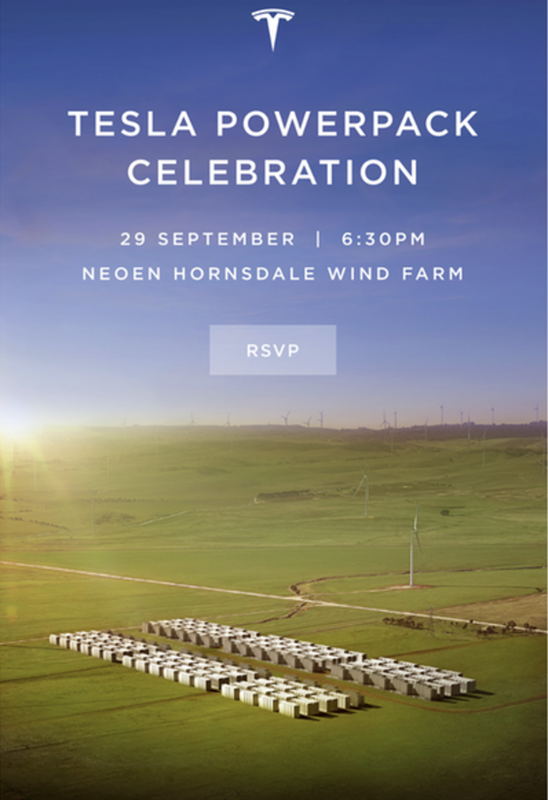 At the new project in South Australia, the battery system will be connected to Neoen’s Hornsdale Wind Farm and it will charge using the electricity generated by its wind power in order to deliver it to the grid during peak hours. Tesla claims to be able to match the 100 MW capacity of the wind farm with its battery packs – making it 3 times the power capacity of the next largest system in the world. Musk hyped the project by claiming that it could be so impressive that it could become a tourist attraction and that people will stop to take a look around. While aesthetics are not as important as enabling a more efficient use of renewable energy, it looks like we will know if it holds up to the hype in just a few weeks.